Our rapid repair products help professionals fix common irrigation problems in minutes that would otherwise take hours or even days. 1. are durable and built to last using premium quality materials. 2. are easy to install and use while requiring virtually zero maintenance. 3. are trusted by professionals to do the job the right the first time. We stand behind our products with generous warranties and U.S. based support to help professionals and end users solve complex irrigation problems. 1. Quality without compromise. We don't believe in cutting corners. That's why we only use premium quality materials to build irrigation products that are designed and engineered to last. As a result our warranty claims are exceptionally low (less than 1/4 of 1%). 2. Unparalleled customer service. Nothing is more frustrating than trying to navigate through automated phone systems when all you want to do is speak to someone. With us you won't have that problem because you're going to talk to a real irrigation expert when you call. 3. Make products that are incredibly easy to use. Irrigation repair can be a messy business digging and trenching through landscapes/hardscapes. We design our products so that you can easily fix common irrigation problems in minutes without all the back breaking work. Transitional Systems Mfg. was born out of an irrigation service and repair business in 1985. It was originally named The Sprinkler Man by the founder Jim Geiger. While the TSM acronym remained - the mission changed. After years of successfully repairing irrigation systems with a product he developed, it was offered to other irrigation professionals. It was so well received that Jim needed to manufacture it in larger volume. 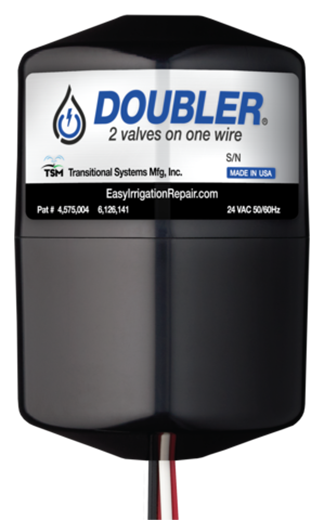 That product was the original Doubler. In 1994, Sean Siebern came on board as an assembly technician and to handle service calls. He soon began working on product design and development as well. As the company and products grew, the TSM name came to be synonymous with solving problems in the irrigation industry. TSM was incorporated in 2001 with Sean acting as VP/COO and by October 2005 he was named as President/CEO. Over the years we have received many calls from people just like you - many looking for solutions or needing help troubleshooting irrigation systems. We always listen to our customers' needs and your input has even resulted in new products and design updates. As the technologies in the irrigation industry have evolved over time, TSM has updated its products to make use of these new technologies. We continue to invest heavily in R&D to refine and update designs ensuring long service life and equipment compatibility.